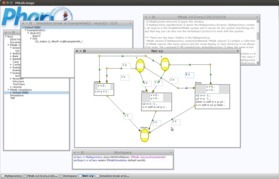 PNtalk 2.0 is the modelling and simulation framework based on the formalism of Object Oriented Petri Nets, which combines properties of Petri Nets with advantages of object oriented system design. PNtalk 2.0 is a new implementation and extension of the origin tool PNtalk from Squeak Smalltalk to Pharo 2.0. 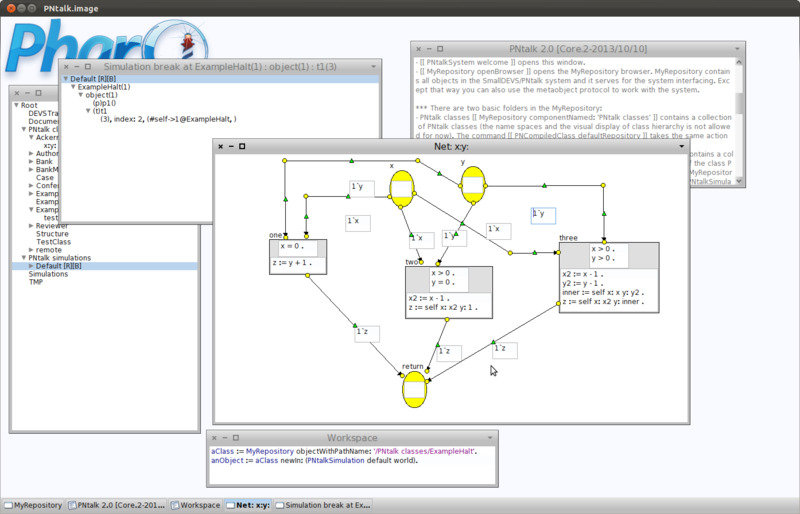 The tool is an experimental software intended for research and education; it supports software design methods using simulation modeling focusing on adaptive systems. This pages provides information about the PNtalk 2.0 system. You may find the latest release, documentations, and news here. The authors would be grateful for obtaining a feedback about using the PNtalk system, new ideas or the system improvement. The new version has been released 2013/10/10. PNtalk has been integrated into structures of the SmallDEVS system. PNtalk can be distributed under MIT LICENCE. PNtalk is available for Pharo 2.0. You will need the virtual machine for your operating system and image and source files, both from http://www.pharo-project.org/pharo-download/release-2-0. Documentation is a component of the image release. Motivation and basic ideas about the PNtalk system and its open implementation. A description of basic reflective features of the PNtalk system. Basic ideas and the architecture description of the PNtalk system, including a simple case study of Bank model. PNtalk and Object Oriented Petri Nets in the project life-time, from conceptual modelling to prototyping. Multilevel system: This example shows using different levels (nets) and their synchronization by synchronous ports. The class WfTest describes the implementation of this problem in PNtalk (see the image, PNtalk-Core-Documentation category).